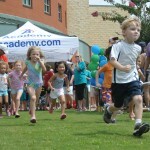 Groups of approximately 20 children will race together. Races will be very 5-10 minutes until everyone has finished. 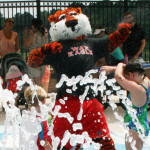 The children will bike, run and splash through the Splash Park! All money raised will be donated to The American Cancer Society. We hope you will join us for a fun family time and an event that is raising money for an amazing cancer fighting organization! Parents, your involvement is important! 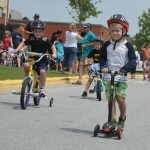 Special attention needs to be given as children get on and off tricycles. Older siblings can also help- We want everyone to have a safe and fun experience. Please remember that this is NOT competitive. Every child receives a medal and a t-shirt. EVERY child is a winner. Pre-registration (early bird registration) deadline is May 25, 2018. Register online or by mail-in only. No drop-offs. Paper registration deadline is 7/20/18. No registrations will be taken the day of the event. Participant maximum cap of 125. 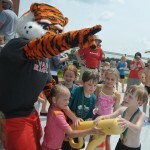 Make checks payable to Sportsplex Tri for Kids. There will be two waves of the Small Fry. 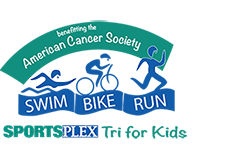 The first will begin around 10:00 a.m. and the second around 11 for those families who have children participating in the kids triathlon.